Sometimes You Own the Trail, Sometimes The Trail Owns You! A week ago Tuesday, after I had all of my planned chores completed, I decided to head off and get in a short ride on the local mountain bike trails. However, I made two critical errors related to this particular day in the woods. The first was not doing a full pre-ride check of my beloved Ventana Marble Peak mountain bike and, in particular, making sure the front suspension fork had sufficient air pressure to function properly. 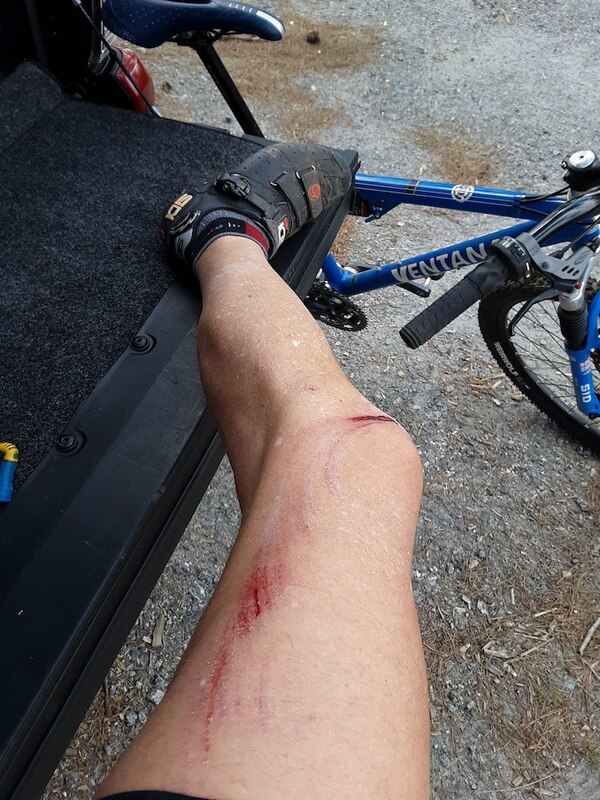 The second was getting to the trail and realizing this, but going ahead and riding with a less than fully-effective front fork and slightly altered steering geometry. The latter made the bike handle a little less precisely than it should or that I’m used to which may or may not have contributed to my clipping a handlebar end on a tree while riding along the trail at 12 mph that sent me flying to the root, rock and otherwise unforgiving ground. Thankfully, I didn’t break or fracture anything, but my left leg from my knee to my waist was pretty banged-up along with my left arm, middle finger and left shoulder. After dusting myself off and assessing my various injuries I knew I was shaken and scuffed up, but otherwise OK as was the bike. So I finished the last 4 miles of the 7-mile loop and headed home to attend to my abrasions and bruised ego. On the bright side, Tuesday’s incident did not keep me off the bike. 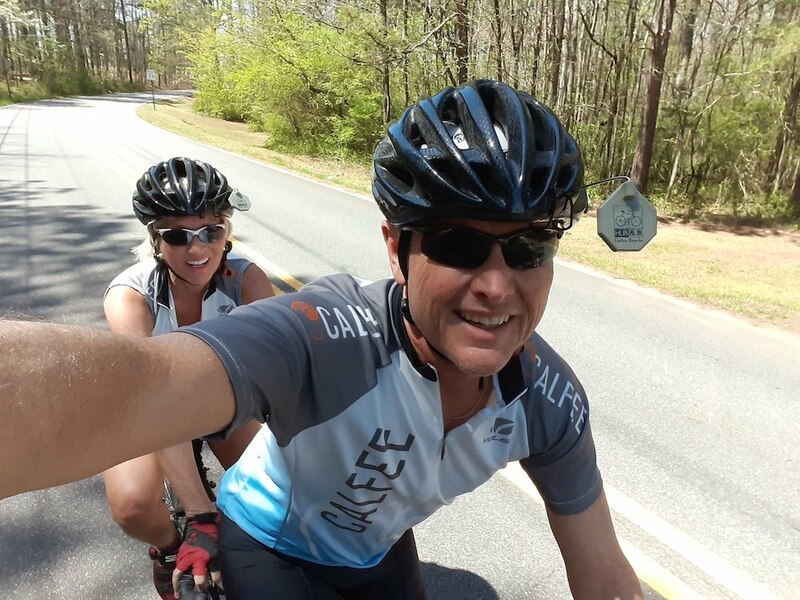 It was around 1:00pm on Wednesday when Debbie and I headed out for a tandem ride; yes, a tandem ride!! It was a lovely sunny day with temperatures in the mid-70’s and a slight wind. Just a perfect day for a ride and, thankfully, with kids out for spring break, the usual afternoon traffic wouldn’t be an issue for us.. and it wasn’t. We had a really, really good ride and were even a bit surprised about how well we rode given such little saddle time over the winter. Yes, we have a long way to go to get our form back and I don’t see that happening by the Alabama Tandem Weekend, but if we can get good weather between now and mid-May we should be in pretty good form by then. Getting back to the off-road incident, a good friend took note that I was still using a 20-year old RockShox SID suspension fork that I’ve rebuilt twice on my 22-year old Ventana Marble Peak. So, it’s actually in pretty good shape, but the technology and performance is well off the standards being used today. With that in mind, I adjusted the air pressure in both the positive and negative rebound chambers and thought about giving it another shot before making a decision as to whether it stays or goes while also shopping around for a replacement. My friends who are active off-road riders suggested a new mountain bike might be a better choice but, quite frankly, since I’m not racing and ride primarily for pleasure and fitness, I can’t see spending that kind of money on a new bike. My old bikes continue to be “good enough” for my needs… and this is a huge step for me as that was never the case during the 80’s and 90’s when I changed bikes and tandems nearly every year.Yes, I was able to get it “sorted out” so it should work pretty well, but it’s far from being 100%. With that as background, I went in search of a fork that’s similar to the one on my hardtail mountain bike — a 2013 Manitou R7 Pro model — and found what appeared to be a 2018 Manitou R7 Pro for reasonable money. 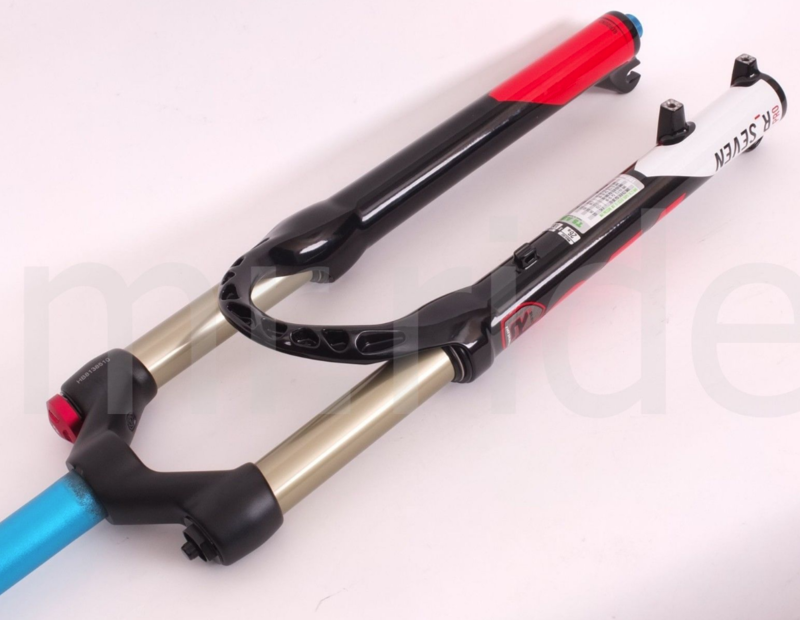 That will give me a fork that I know is easy to adjust and can be set up the same on both bikes to give me similar handling, which is a good thing. It also fixes a problem I ran into when I needed to raise my handlebars and found there wasn’t a lot of steerer tube to work with on the RockShox SID fork based on where I cut it back in 1999 when it was new. It should arrive in about a week, so I’ll be all set to hit the trails on the Ventana again after that. In the mean time I’ll just ride my hardtail. These are definitely 1st world problems… and I remind mindful of that. This entry was posted in Bloggishnish, Technology & Equip.. Bookmark the permalink. 2 Responses to Sometimes You Own the Trail, Sometimes The Trail Owns You! My Ellsworth, is now hanging in the garage, in the farthest, most out of the way spot. I’ll probably be selling it, as it just isn’t going to see any more use. Maybe someone will want it for a city bike or something. Yeah, I get that… but as I said, I’m not chasing anyone other than father time. I’ll put the new fork on the 22-year old Ventana Marble Peak and keep-on keeping on. But, that said, I do appreciate how technology can improve performance. I just don’t have a business case in front of me that supports buying a new bike until my old body is in a lot better shape and riding at the limit where new technology will make a difference.